Gentle at the expense of sour cream and aromatic due to the green dish. Suitable for both everyday and festive table. 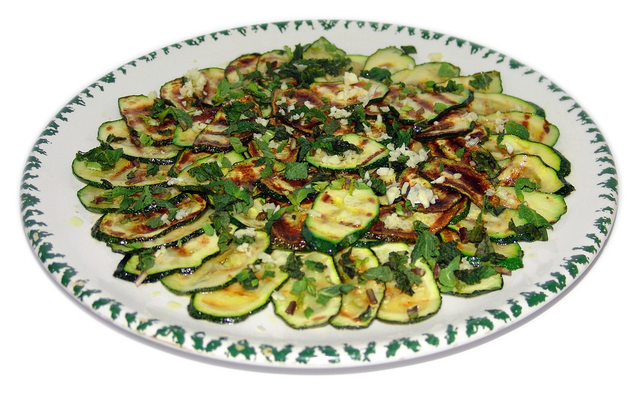 Wash zucchini and cut them into circles about a centimeter thick. Ideal if the vegetable is young. If not, cut the rind. Sprinkle zucchini with salt and pepper and leave for 10-15 minutes. At this time, rinse and crumble the greens. Garlic let through the press. Mix this with sour cream and eggs. Should be a homogeneous creamy-egg mass. Fry zucchini in sunflower oil for 1-2 minutes on each side, until golden brown. Then lay the marrows first on paper towels to remove the excess fat, and then to a buttered baking dish. Pour the zucchini with sour cream and greens and send for 20-30 minutes in a preheated oven to 180 ° C.
In the fight of Humans vs Bots, @megabot defended you with 100.00% upvote courtesy of @techlife! You got a 7.35% upvote from @joeparys! Thank you for your support of our services. To continue your support, please follow and delegate Steem power to @joeparys for daily steem and steem dollar payouts! You got a 33.33% upvote from @whalecreator courtesy of @techlife! Delegate your Steem Power to earn 100% payouts. This post has received a 50.00% upvote from @lovejuice thanks to @techlife. They love you, so does Aggroed. Please be sure to vote for Witnesses at https://steemit.com/~witnesses. You have been defended with a 42.86% upvote! I was summoned by @techlife. You got a 59.96% upvote from @cabbage-dealer courtesy of @techlife! Hey @techlife, Congratulations! Bodzila just upvoted your post with 33.33% power. Keep up the good work! You got a 66.67% upvote from @steembloggers courtesy of @techlife! You just received a 21.43% upvote from @honestbot, courtesy of @techlife! You got a 44.62% upvote from @moneymatchgaming courtesy of @techlife! Please consider upvoting this post to help support the MMG Competitive Gaming Community. You got a 42.86% upvote from @whalepromobot courtesy of @techlife! This post has received a $100.00 % upvote from @siditech thanks to: @techlife.